Hygrometers measure the moisture content of the air. Several different principles of operation have been adopted. 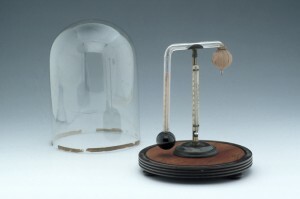 Above is a wet and dry bulb hygrometer. Designed to be mounted on the wall its central barrel is a cylindrical table of relative humidity values. The importance of water is embodied in the word ‘atmosphere’ itself, whose Greek roots mean ‘sphere of vapour’. 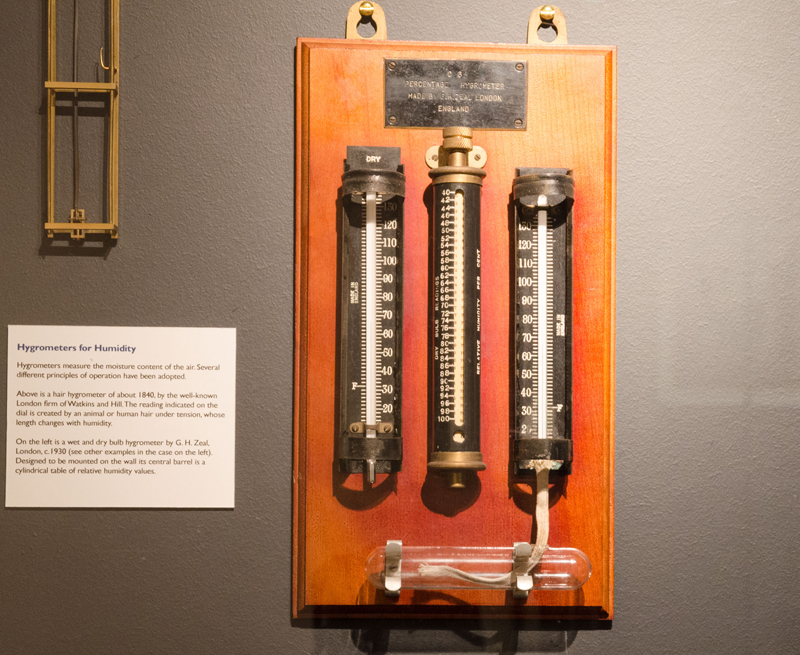 Much of the meteorological effort on water has been based on measurements of rainfall and humidity. In principle, rainfall is the simpler of the two to observe, since it requires only a reliable way of collecting the rain. The detection of humidity has been the subject of far more varied instrumental ingenuity. Clouds are the most visible manifestation of atmospheric water and have been the object of both artistic and scientific study. Their modern naming and classification goes back to the work of Luke Howard at the beginning of the 19th century. The study of clouds also resulted in ‘the most original and wonderful instrument in scientific history’, according to Ernest Rutherford. While stationed at the observatory on top of Ben Nevis in 1894, physicist C.T.R. Wilson decided to try to create clouds in the laboratory. His cloud chamber turned out to be a way of detecting the paths of charged particles, opening up the new area of sub-atomic physics.